Okoawo BlueGate: OBJ AND President Jonanthan At War Over Power? 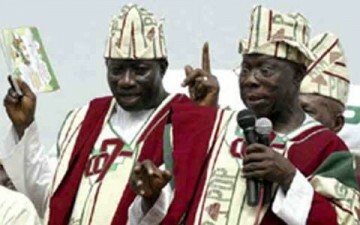 OBJ AND President Jonanthan At War Over Power? What is so strong that has tore their love to shreds, and now, hatred? What can seperate the love of a father for his son or his son over the throne? Not a woman this time, for men are becoming wise over women issues. Only few things: Politice and Money. What can the righteous do if the foundation is faulty? Please, tell me what can save Gej from Obj or Nigeria from Gej?